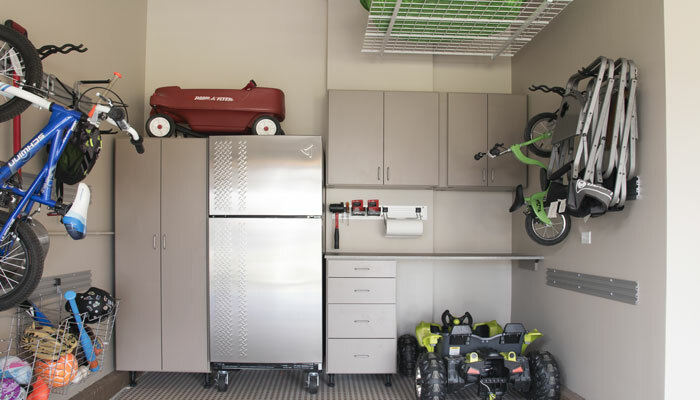 A Garage That Multitasks: From DIY Project Space to Rainy Day Playroom & Traditional Garden Tool Storage — this Garage Has it All! 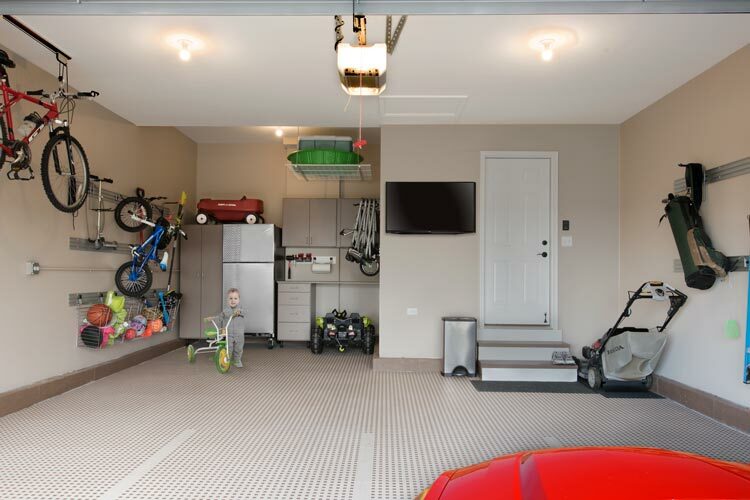 The finishing touch on this garage is the tile floor system. 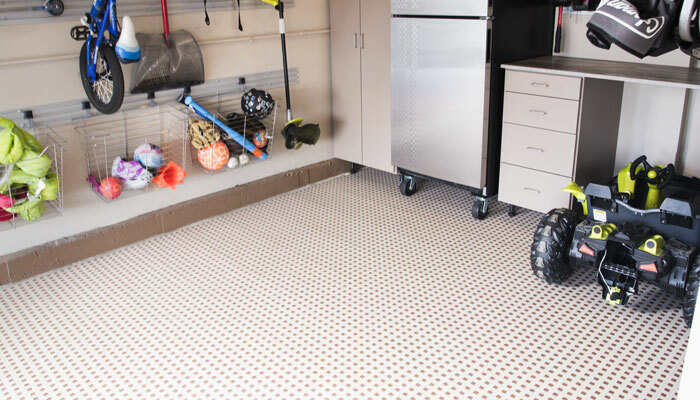 Designed specifically for garage floors, TechFloor® by WeatherTech® is an extremely rugged and durable modualar plastic tile floor system that is both attractive and practical. This modular floor system features raised TractionSquares® for wet or dry non-slip use. 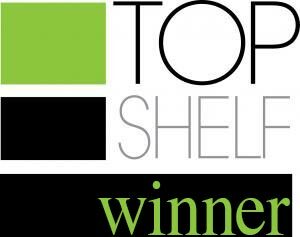 The soft touch, thermoplastic elastomer (TPE) underside has incredible grip on any floor. It resists most household and automotive chemicals and is very easy to wipe clean, making it perfect for the garage, whether your concern is leaked motor oil, spilled latex paint, or dirt that gets tracked in by the tires on the car. The finished floor is perfect as a play area for kids. 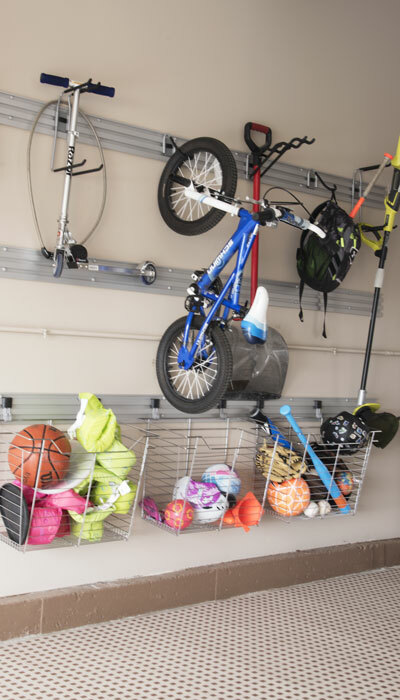 Rainy days and bad weather are no hindrance for the children in this family — everything from riding bikes to playing catch can be done indoors in the new organized garage. 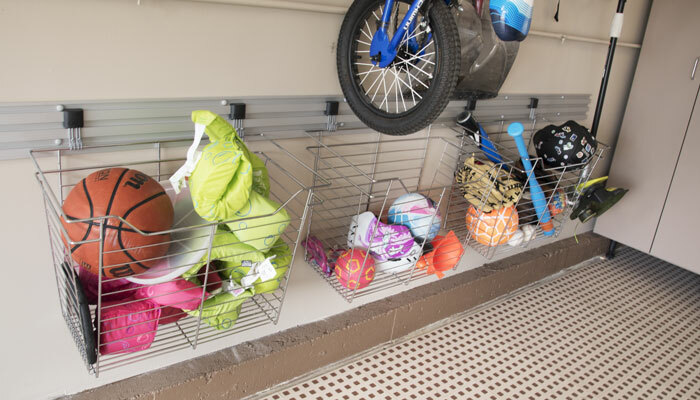 Dangerous yard equipment and chemicals are all stored high up and out of reach, allowing the kids to run around and expend their energy in a safe environment. 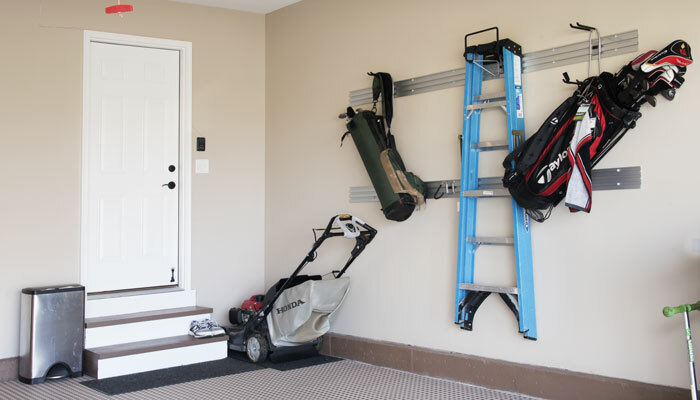 Sometimes your garage has to do a lot more than just store the car. 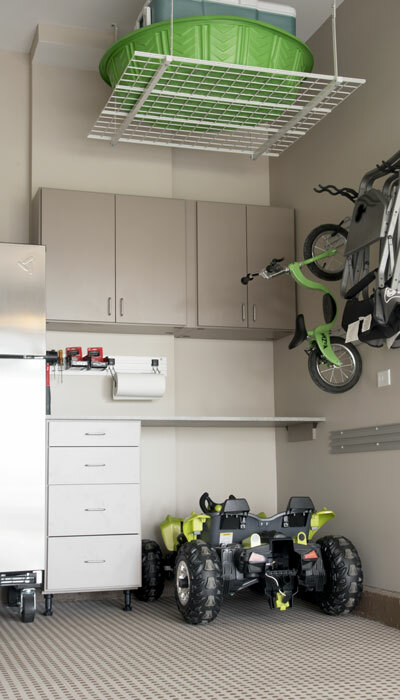 A well-organized garage can serve multiple functions that will expand the usable square footage of your home. 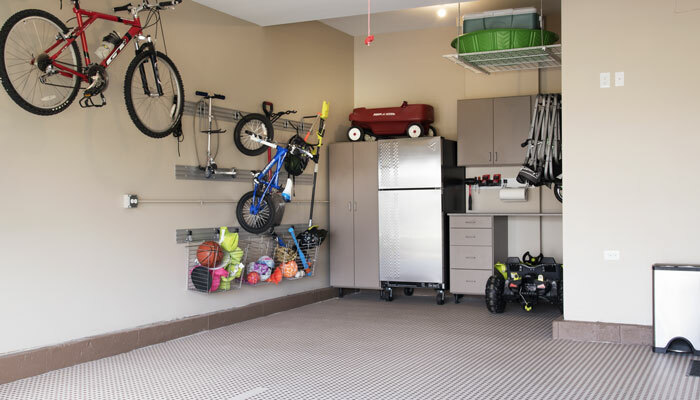 This well-organized garage provides an area for numerous activities. 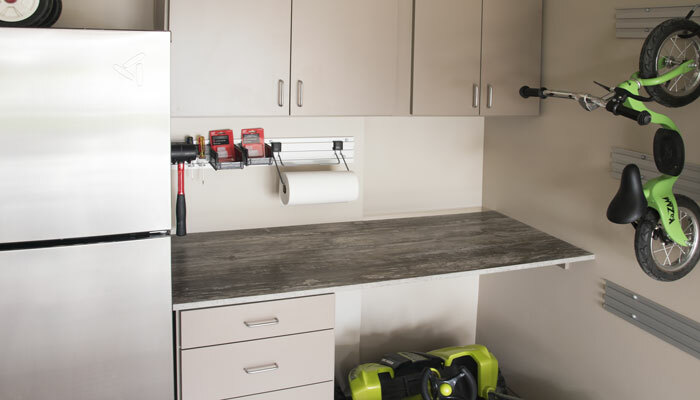 The integrated tool bench with custom built in cabinetry at the far end of the garage handles the homeowner's DIY projects with ease. 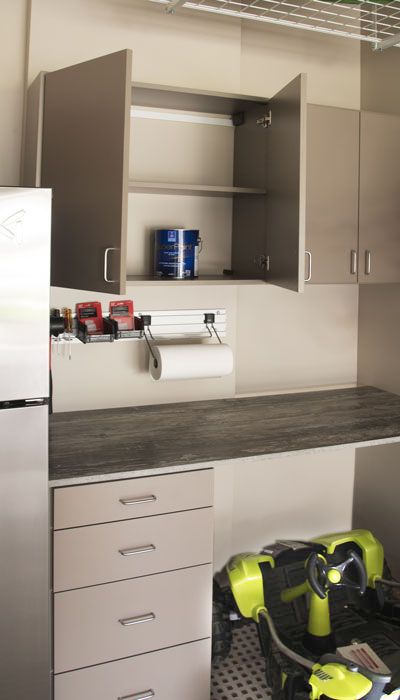 The warm gray laminate garage cabinetry system is accented by a contasting countertop, enhancing the custom look and adding a bit of zing to the garage. 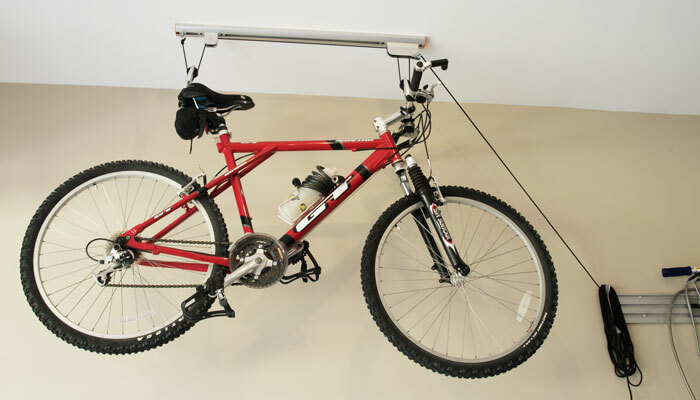 The wall organization components are constructed with a heavy duty aluminum track system from Omni Track. It includes simple snap on hooks, baskets and tool holders that are easy to change as the children grow and needs change. 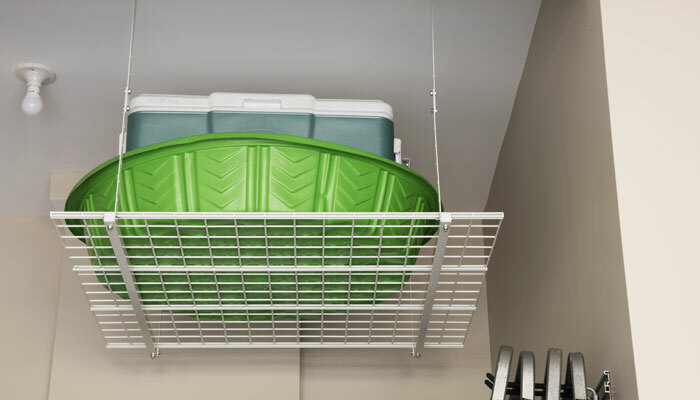 Overhead storage for infrequently used seasonal items is provided above the tool bench area. All the custom storage keeps everything off the floor, allowing for increased space for activities, as well as supreme organization.